Losing some or all of your teeth can pose several health problems and discomforts. Lack of teeth can make eating and talking particularly challenging. Moreover, having no teeth is also seen as a social stigma. Fortunately, the advances in dental sciences have been able to provide more than one option to tend to this problem. In fact, with Now Dentistry you can be in and out with new teeth in just one day. Dentures: How do they actually work? Removable acrylic teeth are known as dentures. They are extremely useful when someone loses almost all of their teeth. Full mouth dentures come in two sets or arches. The set is placed on the patient’s gums and acts and looks exactly like natural teeth. A dental laboratory creates each arch from an acrylic material. The process of making dentures begins with the dentist taking an impression of the person’s mouth and then sending it to the dental laboratory. The lab then makes customized dentures that fit the mouth of the patient well. If going without teeth is not an option for you at Now Dentistry we can create a high quality set of dentures for you in office same day. 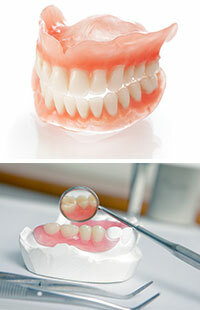 At Now Dentistry, we offer several different kinds of dentures. 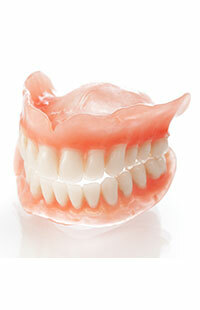 Following are some of the most popular denture types we offer. Our dentists use full dentures when the patent has absolutely no teeth. Whether the Dentist had to remove the teeth for some health reason or the teeth came out on their own, full dentures can easily replace the entire mouth. 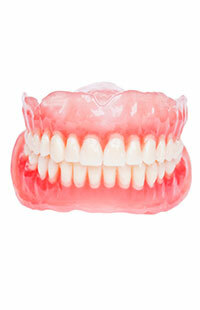 Removable partial dentures are used when a patient has lost most of their teeth. These dentures can also substitute a dental bridge when the patient is missing only some of their teeth. Like traditional dentures, it is important to remove partials to clean them regularly. The process of dentures is long and tiring. Some patients may even be forced to live with missing teeth for long periods of time till their dentures are ready. To avoid such circumstances, patients can opt for same day dentures. Now Dentistry has the expertise and equipment to create hi-quality same day dentures and fix them correctly inside the patient’s mouth before they leave our office. Apart from fulfilling cosmetic needs, these immediate dentures also help to reduce bleeding after the extraction process. In addition, they may also assist in the process of healing. These dentures make for a great solution and ensure that you never walk a day in the public without teeth. You will be able to chew your food easily using same day dentures. At Now Dentistry, we make sure a pair of same day dentures are made on the very day your tooth is extracted so that you’re not left with a broken smile. Denture arches that stand on implants are known as implant-retained dentures. These implants integrate with the jawbone like real roots of the tooth which stimulates the bone and help stop the deterioration of the jaws and maintain your natural facial contours. The only way to stop bone shrinkage, which occurs naturally in areas where the teeth are missing, is to keep it stimulated and alive. Implant-retained dentures are extremely helpful in stopping deterioration of the natural contours of your face. Moreover, since this form of denture is secured using implants you will never have to worry about the denture every coming out while eating or speaking. Unlike full or partial removable dentures or even the traditional dentures, implant retained dentures provide the patient with the security of having the denture connected to the implants. This means you do not have to use an adhesive to keep your dentures in and you will never have to worry about the embarrassment of the denture coming out. Patients also can chew so much harder with an implant retained denture because the denture is supported with implants unlike traditional dentures that are support by the gums. At Now Dentistry, we consider ourselves ahead of our competition as far as implant-retained dentures are concerned. Our latest processes utilize implants for creating immediate results. The procedure is quick and easy. At the time of the process, dental experts place implants within the mouth of the patient. Such implants assist in holding up natural-looking, permanent teeth. One of the biggest advantages to this process is that it offers you brand new permanent teeth same day. These teeth feel and look like real teeth. Since the implants integrate with the jaw, the patient will not lose bone, which is a common problem with dentures. While we are happy to answer all of your questions in person, here are answers to some of the most common queries. My dentist says I’m not a good candidate for implants. Should I completely rule out getting Hybrid Prosthesis? What is the cost of implant-retained dentures Vs traditional dentures? It is difficult to name a price. Every case is different and the price depends on the complexity of the patient’s mouth. We offer free consultation, so you are free to call us and set up an appointment for learning about the price. NOW YOU HAVE SO MANY REASONS TO SMILE! BOOK A FREE CONSULTATION TODAY!